Science, Consciousness and Evolution | Fourth Dimension Inc. 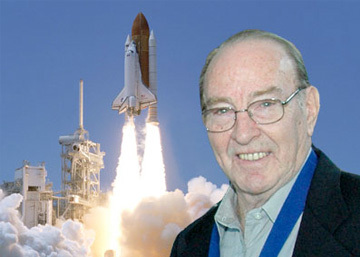 In 1971 Apollo 14 astronaut Dr. Edgar Mitchell became the sixth man to walk on the moon. On the return trip to earth, he had a transcendental experience, a spiritual awakening which changed his life. He retired shortly thereafter from NASA and founded the Institute of Noetic Sciences to sponsor research in the nature of consciousness as it relates to cosmology and causality. In this interview, Dr. Mitchell talks about his experience and philosophy. What was your experience in space? On the return trip home, gazing through 240,000 miles of space towards the stars and the planet from which I had come, I suddenly experienced the universe as intelligent, loving, harmonious. Indian yogis would immediately suggest that you were experiencing the kundalini force. Yes, that’s exactly what I was experiencing, the primordial energy of the universe, the primal and subtlest energies. Were you the only astronaut to have a spiritual experience in space? Many of us had a spiritual experience. One expressed this experience in terms of Christian concepts. Others have expressed their experience in terms of an environmental context. I have expressed myself in an intellectual inquiry. I don’t want to speak about the experiences of the other astronauts. But I do suspect that it was this kundalini that they were experiencing too. After the fact, several of them sought to find out what this experience was. The basic experience is one of a “high” experience, to perceive anew. It’s the mountaintop experience, to see the same landscape from a new perspective. How did Nasa respond to this? We didn’t really talk about it much with them. NASA wasn’t very philosophic. Most of us left NASA. What did the experience mean to you? I was raised as a scientist, to assume that the fundamental organization of the universe was accidental. But my religious training, which was fundamentally Christian, accepted the divine origin, or blueprint. Those two ways of thinking are not compatible. I now describe our universe a little differently; as evolutionary, intelligent, participatory and continuing to learn. What we call God is the mind of the universe, and what we experience as physical reality is the body of the universe, if you want to anthropomorphize. The creative force behind the universe is the same creative force we experience within ourselves. What was it like to be on the moon? When you’re working, you’re concentrating on your work. So the opportunity to be introspective and awestruck was limited. It was the culmination of an explorer’s dream. The most profound experience was to look back and see earth in the setting of the entire cosmos. What do you mean in your writings when you say “We’re reaching for the past”? Science has taken the assumption that physicality came first and consciousness came second which, on deeper reflection, cannot be. Consciousness had to evolve. Matter and energy had to be conscious in some primitive sense for life to exist. They had to be simultaneous. The universe did not have volition unless it had volition initially. Pure consciousness is that which was always there. How do you regard religion? I have talked and studied with spiritual teachers from virtually all religions and found that, at the core, they’re saying the same thing in different languages, different interpretations. But essentially, we’re reaching for the same point. For example, the Taoist tradition in China always had the notion of the tapestry of change, the holistic concept, and that change was interwoven in that tapestry of life. The Vedic tradition brought us insights very early as to how consciousness operates. Buddhism brought us a marvellous psychology of how to condition the mind. Coming out of the Judaic tradition was a unified notion that there’s really only one fundamental principle. Then the Greek tradition brought us discursive reasoning. So I find we must pull from all the religions. Modern understanding is teaching us that our subconscious creates our reality. We programme ourselves the first few years of life; we spend the rest of our lives creating that reality. We create the circumstances of our lives according to the way we’re programmed. If we find life is not working for us, we change that. The mystics and yogis of all times have all done that through meditation, and they sometimes take a lifetime to do it. The modern challenge, as I see it, is to compress that, to be able to change ourselves, our physical reality, more quickly. What is your center working on? We’re teaching subliminal dynamics, in which we teach precisely how people may do this. Not everyone can book a seat to the moon. How can earthling non-astronauts have this experience? You don’t have to go to the moon to produce new insight. I suggest you listen to what others, the ancients, experienced and then internalized them for yourself. What has generated the change in consciousness being observed today? It’s being created by crisis, by the fact of breakdown of our institutions, and the awareness that we have so populated the earth and so misused our technologies. We have been so asleep and unaware that the crisis that we have created is forcing us to [change]. What would you ask today’s youth to observe and practice? To learn to live, to discover the process of the planet, of the cosmos. To live in harmony with the process. I do not believe in absolutes. It’s an evolving universe, and what we used to consider absolutes no longer hold. We must hang on to many fundamentals, like love, integrity, but we must also be a part of the process of evolution.